Andrey Zvyagintsev captivates his audience with long cinematic shots of the urban and wild Russian landscape composed of muted colours as his characters fall far into dismay and further out of love, making Loveless an emotional and at times triggering film. The narrative follows Zhenya (Maryana Spivak) and Boris (Aleksey Rozin), a bitterly divorced couple as they track down their runaway son Alyosha (Matvey Novikov) who has been on the receiving end of his parent’s fallout. 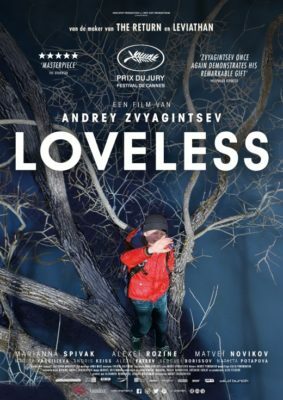 Loveless is a film that focuses on the deeper emotions such as loss, isolation, melancholia and raw hatred. Even with many long scenes of passion, there is a strong undertone of lost love which parallels the setting of the film with the prophesied doomsday of 2012 and later the unrest in Ukraine. Loveless succeeds in drawing you into its desolate setting, leaving you emotional and without reward as the credits roll across the screen, making it one of most powerful films of KFF.